In this unique NC State innovation competition, students design and prototype solutions to sustainability challenges. Imagine a future where the power of your footsteps can generate electricity. That’s the student idea that took home top honors in NC State’s third annual Make-a-thon, a sustainability innovation competition. 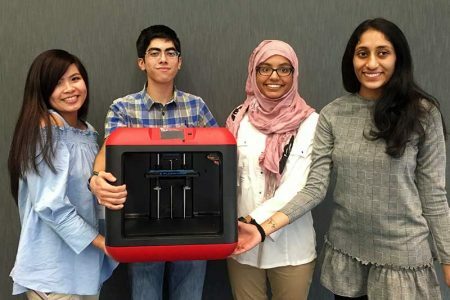 Students Alberto Carrillo, Priyanka Kallem, Mariam Shah and Gabrielle Tonsay designed a layer of piezoelectric-discs that can be installed underneath floors to convert the energy of footfalls into electricity. The winning team at Make-a-thon received 3D printers. 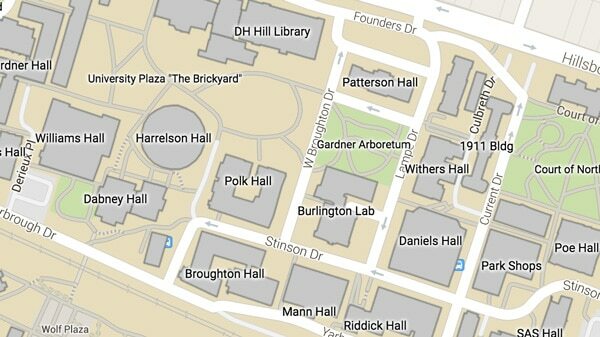 One of the goals of Make-a-thon is to kickstart ideas that could improve the sustainability of campus, the community or world. The Jan. 26-28 event brought together 148 students on 39 interdisciplinary teams representing 10 of the university’s colleges. Armed with actual campus sustainability data, student teams spent the weekend researching, designing and prototyping sustainability innovations. The best solutions earned prizes such as 3D printers, cameras and virtual reality headsets. Organized by NCSU Libraries, University Sustainability Office and four University Housing living and learning villages (Engineering Village, Women in Science and Engineering, EcoVillage and Albright Entrepreneurs Village), Make-a-thon is sponsored by the NC State Foundation, NC State Sustainability Fund, Autodesk and NC State Entrepreneurship. Make-a-thon kicked off Friday night with NC State alumna Maria Kingery sharing her experience as an entrepreneur in sustainable energy. Then, College of Design faculty members Tania Allen and Sara Queen introduced students to design thinking as a tool for developing their ideas. 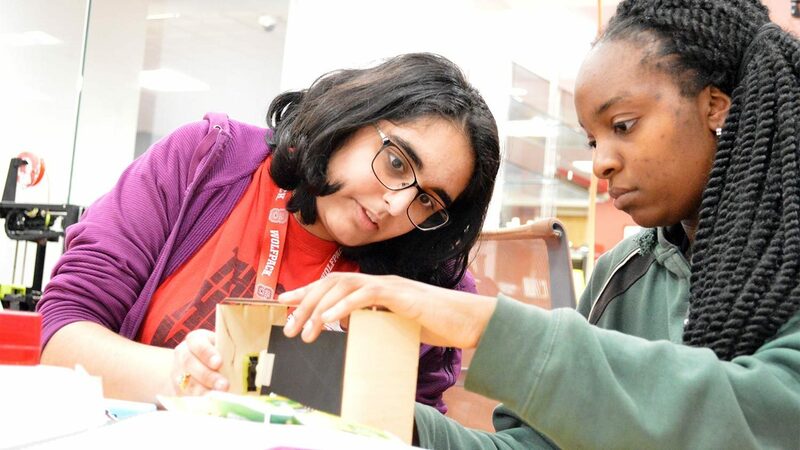 On Saturday, many teams gathered in the Makerspace at D.H. Hill Library to turn their ideas into prototypes. Teams used technologies ranging from 3D printing and microcontrollers to virtual reality and Internet of Things (IoT). “We were surprised how much better the idea became over the course of the day,” said Matt Bryan, whose team created a campus reusable cup program. On the competition’s final day – less than 72 hours after Make-a-thon began – teams pitched their ideas to nearly 40 judges from campus, local businesses and the community. 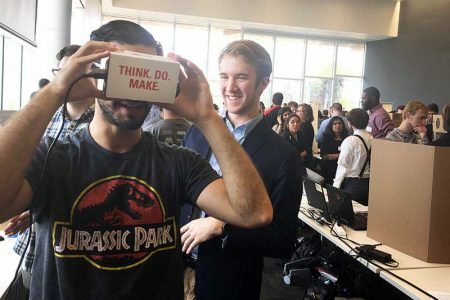 Students experience the virtual reality prototype created by a Make-a-thon team. Ideas presented at the Make-a-thon finale ranged from solar-powered window blinds to plants with sensors designed to eliminate unnecessary irrigation. Students prototyped virtual reality education tools, receptacles that automatically sort waste, sensors that detect when home air filters need to be replaced and internet of things-enabled buildings that optimize efficiency. All ideas included an interdisciplinary perspective due to a competition requirement that teams include members from at least two of the university’s colleges. Though Make-a-thon is over, many teams indicated their idea isn’t. Between university funding opportunities such as the Sustainability Fund and the Lulu eGames, it’s possible some projects could become actual products.